Thompson, Bob & Jameson, Carl (2019). 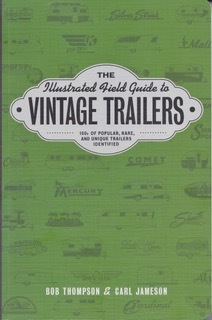 THE Illustrated Field Guide to VINTAGE TRAILERS. Layton, Utah: Gibbs Smith Publishing. A vintage trailer owner must have! Okay, I’m going to make this review brief (or maybe not); because this book is the most inclusive and comprehensive reference publication on vintage trailers to this date. It is useful for first time buyers as well as for the old-timers involved in the restoration, preservation and recreation of/with our vintage trailer gems. 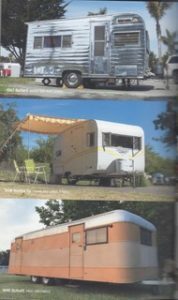 When folks get interested in a vintage trailer, it is by attending shows and rallies that they gain insight into what they might like for themselves. 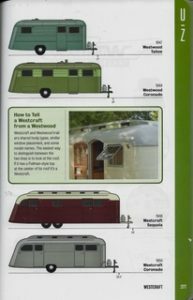 This is a good guide to use to begin that journey and also a historical reference to identify the different makes and models. 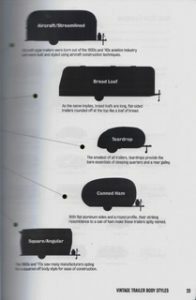 Bob and Carl have identified the many trailer body styles, manufacturers, and locations where the trailers were made. 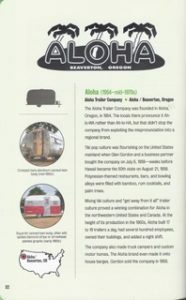 Of course there were more trailers manufacturers than are highlighted in this book, but many of them only survived a year or two – – or significant records have been destroyed or lost. The trailers are listed A to Z from Aero Flite to Zipper. Never heard of a Zipper trailer? You have now . . . The authors traveled all over the United States and consulted with many knowledgeable experts to produce this book. While the book cover is described as paperback, the cover is made of high quality stock. The book is perfectly sized to hold even in my small hands altho’ there are 320 pages. There are more than 400 photographs of actual vintage trailers or features and more than 500 illustrations of the different models. Bob and Carl take you on a sojourn as to why and how the book got written. First time vintage trailer owners will be able to empathize with their experience. The introduction sets a warm pace with the guys thanking and thinking of their families (kudos). I really enjoyed the introductory which explains their motivation and efforts to get this done. They also have a table of contents, index of manufacturers and trailer glossary among other interesting tidbits. In addition, they have a 12” x 18” THE BIG POSTER OF VINTAGE TRAILER LOGOS for sale on their website: vintagetrailerfieldguide.com When we use to co-host [co-wagonmaster] the original Trail Along to Pismo Vintage Trailer Rally, I put a page of vintage trailer logos into the activity booklet, only one time, of a few trailers that were attending; but this poster is very, very inclusive and worthwhile for collectors. I know I now proudly own one. Thank you, Bob and Carl, for taking us on your 5 year journey in amassing all this history and content. You are so appreciated!!! With full disclosure, two of our vintage trailers and portions of both are included in various pages throughout the book. It was an honor and privilege to participate in a very, very small way as did many, many others. While we are acquainted with a good number of folks or trailers in the book, there are many which we do not know; however, the more the merrier and newcomers are always welcome to the vintage trailer community!